Photos by the National Theatre. Ningyo Johruri Bunraku, a form of traditional Japanese puppet theater, is not a show for entertaining children. Even for modern Japanese, this performing art is a complex one to comprehend. You can tell because many fans — not just newcomers — watch the performance with earphone guides and subtitles in Japanese. Alongside kabuki, bunraku is a designated World Intangible Cultural Heritage of Humanity. 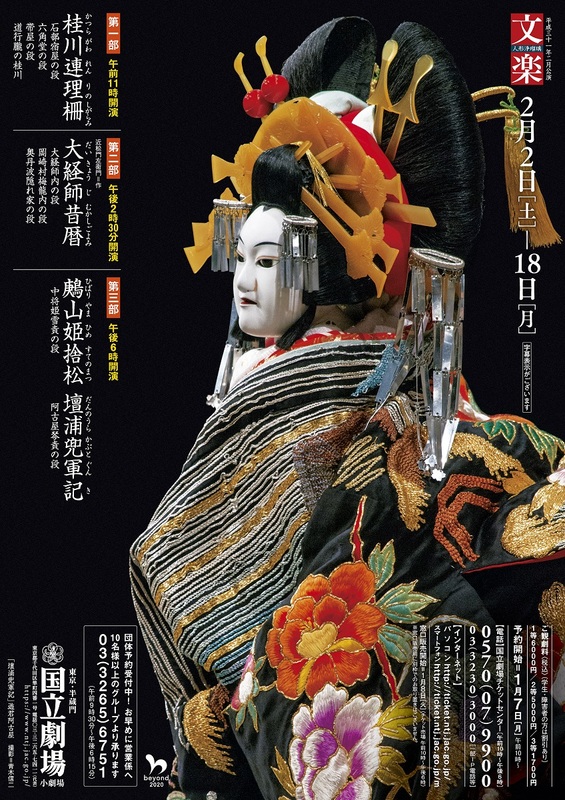 However, unlike kabuki, which is full of entertaining elements that allow the audience to amply enjoy the show through the actors’ larger-than-life performances and beautiful styles, Ningyo Johruri Bunraku does not share the same flamboyance. Audiences who go see bunraku seem to be quietly engaged in a world of their own during the performance. And, in a sense, they seem to have a certain level of intelligence and sensitivity. Of course, there are no such things as fan clubs for the puppet dolls. Here, though, one can get a glimpse of Japanese uniqueness unlike any other in the world. During the past few thousand years, Japan has learned much, including the teachings of spiritual culture from China and Korea. Over the past 150 years it has also been vastly influenced by Western cultures. However, once those influences reach Japan, they evolve into their own unique ways and become cultural elements of Japan, unparalleled in the world. Bunraku is among them. Especially marvelous and powerful are the live stage sounds. There is the music of gidayu chanting, the bunraku narrative recited by the tayu (chanters), one for each of the characters speaking in the play. Their chants are delicately interweaved with sounds of the shamisen. The chanted words are in old Japanese, so naturally they cannot be understood, but one only needs to engage in the atmosphere. Only those who experience the live sounds can understand their excellence. Minosuke Yoshida, a living national treasure, his apprentice Kanjuro Kiritake, one of the most celebrated bunraku performers of this generation, and Tamasuke Yoshida, a mid-level puppeteer who in 2018 succeeded his grandfather by taking on his name, stand out among the performers. Together with the younger generation of puppeteer performers, they are among those who lead the bunraku world. Watching these masters breath life into the ningyo (puppets) and manipulate them on stage is like watching human actors perform. They invite the audience into a wonderfully mysterious and very special world. For first-time bunraku viewers, a program featuring a living national treasure and other celebrated puppet performers bringing the dolls to life is magical, even if the story itself is not well-understood. For veteran fans, the impact of such talent is even more powerful. Unlike kabuki, the theater itself is a smaller establishment and performances sell out quickly so you may not get a chance to watch performances so frequently. On the other hand, every seat in the National Theatre has a great view. Tokyo and Osaka have the most number of shows, so check for dates and book your tickets in advance and try out a live performance to get a feel for the world of bunraku.